1	Heat the oven to 180ºC, gas mark 4, and line a 12-hole muffin tin with paper cases. 2	To make the cupcakes, beat the butter and sugar together with an electric mixer until very light and fluffy. Add the eggs, one at a time, and beat until well mixed. Once the eggs are incorporated, add the flour, baking powder, xantham gum, vanilla extract, poppy seeds, lemon juice and half the lemon zest. Fold with a spatula until well combined. 3	Divide the mixture between the paper cases, flatten and smooth the surfaces of each cupcake with a knife, then bake for 20–25 minutes or until risen and golden. Allow to cool in the tin for 10 minutes before transferring to a wire rack to cool completely. 4	Use an apple corer or teaspoon to make a small hole about 2cm deep in the top of each cupcake. 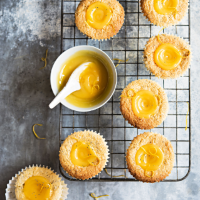 Spoon or pipe the lemon curd into the holes and top with the remaining lemon zest.